Oppo launched a smartphone of the RealMe Series and made it a tremendous hit in India. Because it is the first such smartphone in the market of a large brand, in which the feature is given like an expensive phone, but the price is like a small brand phone. 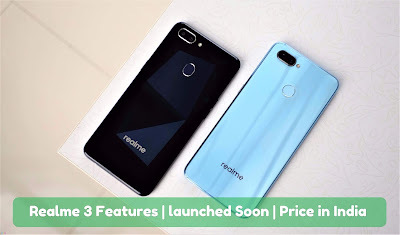 Recently, RealMe launched a new series smartphone in which RealMe One with Realme 2 and Realme 2 Pro is included. Now the company has a new SmartPhone of this series. You are called to be Realme 3, but before the teaser launch of this phone is it's all features now went leaked. 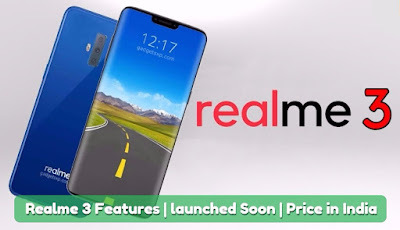 If the news were to be believed, the Helio P70 processor would have been given with a 6.4 inch FHD AMOLED display in the Realme of the new upcoming smartphone Realme 3. This phone can be exactly like the look of the Find X in Oppo, where the sliding camera Many unique features have been provided with this report. According to the report, this smartphone will have a 24 + 16 + 5 megapixel triple camera with fast charging and two 16 + 12MP camera in front. The Realme 3 screen ratio can be 95 percent, i.e. the flower view display must have been given. In addition to this, there will be a fingerprint sensor besides the Face Unlock feature and many new features that are not available in any major brand smartphone. And if you talk about the price then this phone can cost between 16 to 18 thousand rupees.